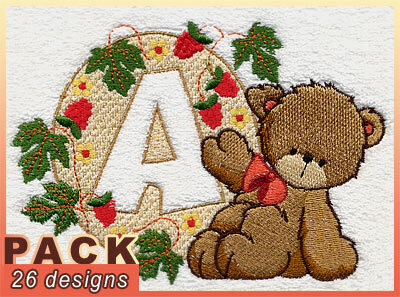 Is there any chance that this alphabet will be added to the Cute Embroidery Alphabets page as well? I'd love to get it, but I don't have additional money to spend after my subscription to Cute Embroidery (which I love and don't want to be without . . . hint, hint to anyone who hasn't purchased their own subscription). This is gorgeous, maybe it will be a free one later. A gorgeous alphabet, thank you! I collect Strawberries and these are one of the cutes sets I have seen. For those of you asking about size. Click on the letter you want to know about and the size, etc. will be to the right of the picture. These bears are soooooo cute. I love this Bear alph. what size is it? I love the (straw)berries, cute alphabet!! These are adorable, especially for Christmas pillow cases for the kids.